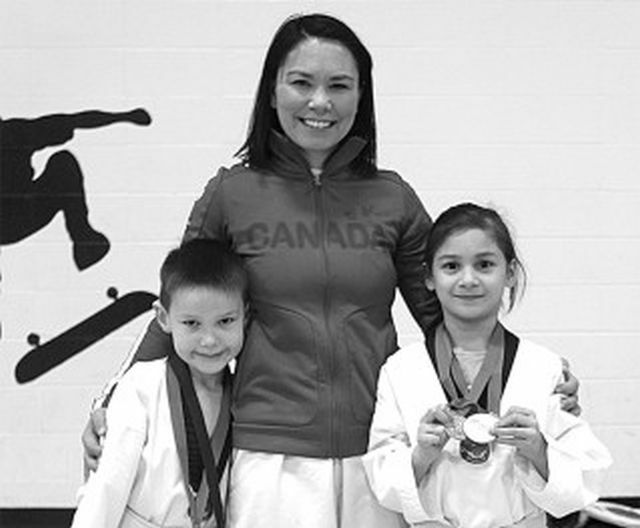 Master Melissa Isaac, centre, poses with her two medal winners: Evan Hicks, left, and Arianna Palisoc. On Nov. 24, Scorpion Tae Kwon Do had four club members attend the 2018 Tiger Challenge Tournament in Edmonton. There were over 250 competitors from Alberta who travelled to the tournament. Second-degree black belt Amira Sharkawi, 14, and Master Melissa Isaac showed the sport some support by refereeing sparring matches and judging the Poomsae competition. They both put in long hours that day and learned lots about competition to bring back to the Scorpion Tae Kwon Do club. White belt Arianna Palisoc, 6, and Yellow Belt Evan Hicks, represented the club as both Poomsae and Sparring competitors. Palisoc earned a bronze medal in the Poomsae Competition 6-7 year old white to green stripe division. There were six in her division and she placed a commanding third at her very first competition. In Sparring Palisoc fought an older green stripe. After the first round there was quite a large points gap. In the second round Palisoc managed to close the gap margin but ultimately lost the match. “I am extremely proud of Arianna. She began training tae kwon do in September and has worked really hard to be a competitor and great student. I can’t wait to see her performance at our testing Dec. 5-6 and the Whitecourt Tournament in January,” says Master Isaac. Evan Hicks, 6, won silver in his yellow belt Poomsae division. There were four in his division. “Evan performs in a calm, calculated manner. He is always thinking of the next move and projecting confidence,” says Isaac. In sparring, Hicks won his first fight with a two-point spread. In his second fight, Hicks lost to a much more experienced competitor. He was awarded a bronze medal for sparring. Next up for Scorpion Tae Kwon Do, Dec. 5, is the Fall Session Testing. The club has 16 students attempting for their new belts. Their second Session starts Jan. 8, new students are welcome to come to the two-week free trial at that time. Scorpion Tae Kwon Do is located at the High Prairie Elementary School and runs classes on Tuesdays and Thursdays from 6-7 p.m.
Jan. 26, 2019 is the 29th Annual Whitecourt and District Championships. “This is an important tournament to our club because it is the closest one that is hosted in Northern Alberta,” says Isaac. Master Rennie Sr. of the Whitecourt and District Club helped the development of Scorpion Tae Kwon Do 20 years ago and there continues to be a strong affiliation today. “Master Rennie Jr., Master Tara Rennie, Master Wilhelm and Master Braun are more like family and any way I can support their club I will continue to do. Without them Scorpion Tae Kwon Do in High Prairie would not be possible,” says Isaac.